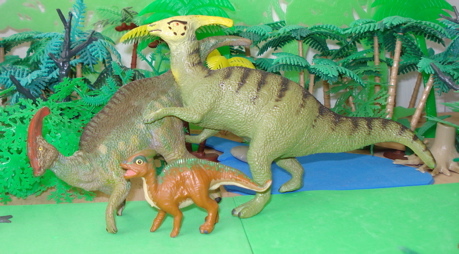 Dinosaur babies are an essential part of a Dinosaur toys collection. 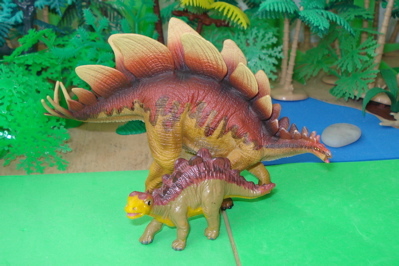 Dinosaur babies are kind of a sub-set of adult Dinosaur toys. 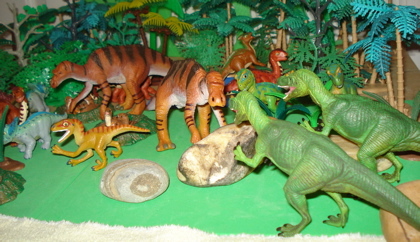 Today's Dinosaur collector has a great range of choice in picking Dinosaur toys. Dinosaurs of all sorts abound in the 1/30 to 1/40 or so scale and a great variety of species are represented. But when it comes to young Dinosaurs the choices are more limited. While several companies make "young-" Dinosaur toys ( the Carnegie and the Schleich baby Apatosaurus and the Safari Dinosaur babies jump to mind) these are fairly rare and far between. More common and more available for being dragooned into 'playing' Dinosaur babies are the many smaller sized Dinosaur toys that are extant on the Dino-market. 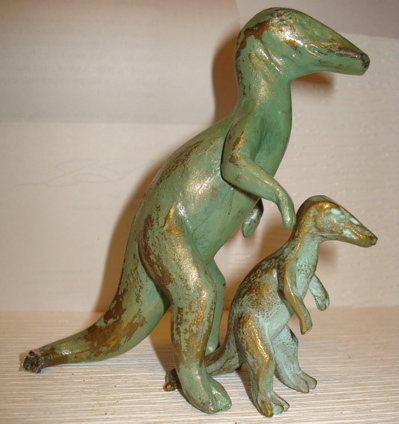 The earliest Dinosaur babies are, arguably, from the 1947 SRG soft-metal Dinosaur toys figure set. (Left- the Trachodon, large and small) These included a Brontosaurus, Dimetrodon, Mosasaur, Plesiosaurus, Stegosaurus, Trachodon, Triceratops and Tyrannosaurus Rex. In each case there was a larger and smaller figure. A potential family for each. These were sold in museum gift shops (I got mine at the AMNH) from the late 1940s through the 1950s. They were metal, fragile and today are definite collectibles. I seem to recall the small ones sold for $1.25 each which was pretty darn pricey for 1951. 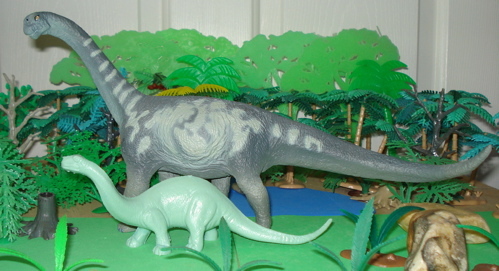 1988 saw the introduction of the Carnegie Apatosaurus adult and baby (Below). 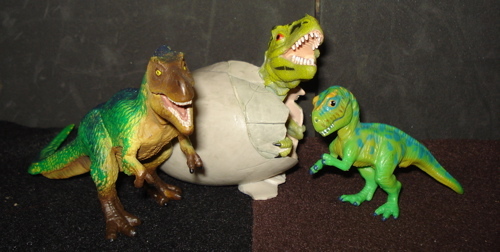 And in 1996 they came out with their Maiasaura and nest (Below). "There is something annoyingly familiar about you two. 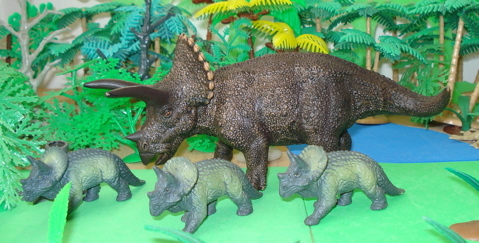 (Below)We see a Safari Triceratops (in green) with a "blue" Carnegie Triceratops accompanying a pair of (blue) dedicated 1997 Safari baby Triceratops. "Sorry. We don't believe that you are temperamentally suited to taking care of small children." "But we especially like small, tasty children. Uhhhh... we'll go now." 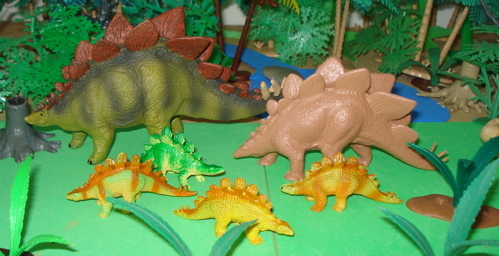 But when it comes to a dedicated Stegosaurus baby they don't come any cuter than the 1997 Safari dedicated Stegosaurus Dinosaur babies (Right) parented by the 2007 Safari adult Stegosaurus. There is no particular reason to believe that Dinosaur babies were cute and cuddly like (most) baby mammals, with large heads and eyes and benign un-aggressive expressions. But they certainly do make for very cute Dinosaur babies toys. "WE NEVER refer to the children as 'fresh meat'!" "(it was just a slip of the tongue)"
seen with the Safari Great Dinosaurs Spino and the Wild Safari adolescent, all dressed in "hunter-orange") or the 1993 Safari Dinosaurs of China striped Velociraptor with the very perky, almost hyper Safari 1997 Utahraptor baby (Above) are often among the cutest of the Safari Dinosaur babies. Other manufacturers, when you use the smaller scaled figures, don't come up with nearly the same level of adorability. In the case of the Bullyland Tyrannosaurus Rex (Below) the baby is meaner looking than the adult. 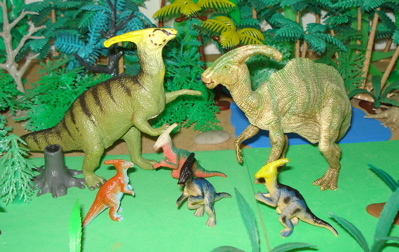 "We're not going to bed unless you give us a Parasaurolophus-Pop first!" "No snacks before bed. 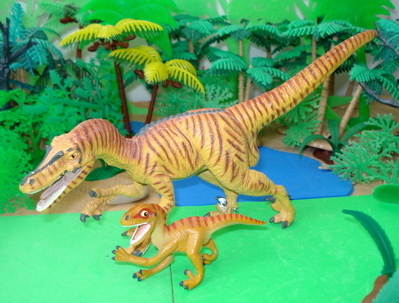 Well, maybe a Hadrosaur & Cheese cracker"
Even the old MARX Dinosaur toys, now small enough to take the part of Dino-babies themselves, have their own miniature copies (Left- Marx Allosaurus) that can readily serve as Dinosaur babies. creating more options for imaginative and fun play. In fact, the new Safari T-Rex may be considered as a juvenile itself given the relative size of its feet. 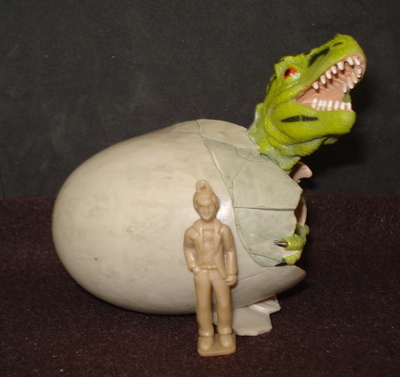 In addition to the standard cutesy Dinosaur babies Safari Ltd. has, in their Dino-Discoveries line, introduced a "T-Rex Hatchling" (Right) and their extremely cool "Oviraptor on Nest" (Below) which is really more of a statuette than a toy. In both cases these would grace the shelf of any Dinosaur lover. "YOU scare the heck out of us"
"We consider this 'looks' and dietary discrimination. You'll hear from our lawyer"
Now that "lawyers" have been brought into the mix we might point out that the 'Para-legal-ophus', in addition to being one of the more popular Dinosaur toys figures has a number of miniature Parasauropholii (Left- PAPO and Carnegie Parasaurolphus with miniatures) to play the Dinosaur babies role. (Below)- Two adult Carnegie Parasaurolophus watch over a 1997 Safari Ltd. Para-babe, who has a perpetually frightened look on its face. 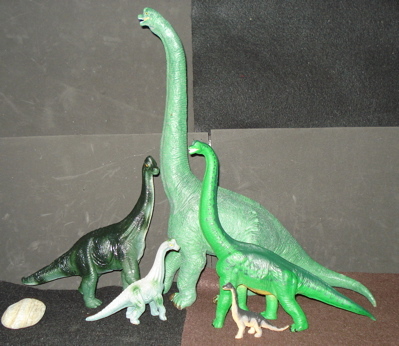 Carnegie Brachiosaurus, left, shown with both "Made in China" and Safari Brachiosaurus (bright green- next largest) have a large number of various sized, but invariably smaller figures that will readily take the part of Dinosaur babies. Thus the enterprising collector can create large and realistic herds with the relatively inexpensive (and hollow, light weight) 'MiC' figures. 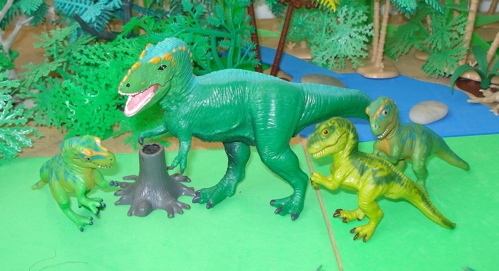 Finally (for our purposes) Safari Ltd. has their own Wild Safari brand Apatosaurus from 1996 which teams up well (at least color-wise) with the 1997 Safari Dinosaur babies figure- below. One of the nicest things about this particular figure is the active and dynamic pose the larger figure is in. 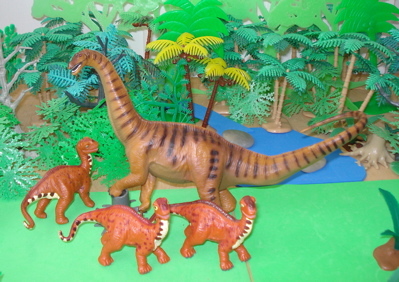 Both figure's size lends them to playing "young Sauropods" in herd scenes. Both of these are out-of-production as of 2010 so pick yours up while you still can. If you care, that is. 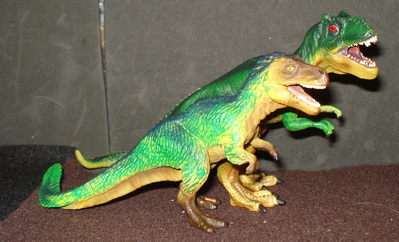 I know that it is only as an adult that having young/baby Dinosaurs in my collection become important. "But I only want to work the lunch shift.... Not full time." Dinosaurs were long thought to have been largely absent parents, leaving their eggs to hatch and their babies to grow up on their own. More recent thinking, with much fossil evidence in support, indicates that Dinosaur babies did, in fact, receive considerable and long-term care from their parents. Whether carnivorous Theropod or peaceful Hadrosaurus Dinosaur adults seem to have valued and taken care of their progeny just as modern animals do. The Carnegie Maiasaura (good mother lizard) and other Hadrosaurs lived in large herds, building their nests close upon each other and providing safety for their chicks in their numbers as they had no natural weapons. Triceratops and Stegosaurs lived in herds as well, their horns and spikes in addition to numbers providing safety for their babies. Sauropods, like (the Carnegie) Apatosaurus often had young mixed in with the adults of the herd. 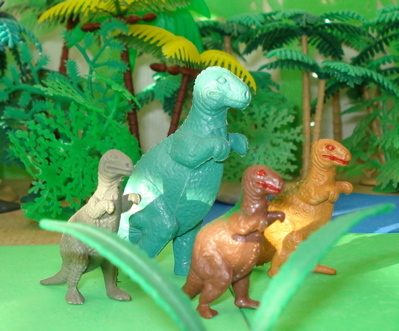 The larger carnivorous Dinosaurs are believed to have taken care of their chicks as well. Nests of, for instance, Tyrannosaurus Rex show evidence of long term care and attention by adults, throughout early "chickhood." Many of these Dinosaur babies are now no longer in production. 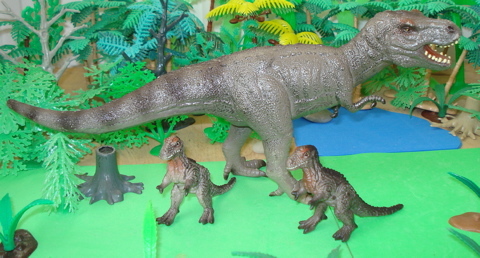 As of 2010 the Safari series baby Apatosaurus, Brachiosaurus, Hypacrosaurus, Parasaurolophus, Pteranodon, Spinosaurus, Stegosaurus, Triceratops and Utahraptor are all out of production, only the Tyrannosaurus Rex baby still being made. I have seen bins of these in both higher-end toy stores and Target as well as finding them online for $2.25-$2.49 (plus shipping). While the Safari dinosaur babies are quite cute I have severe doubts about their accuracy. While I find them to be quite sympathetic as prey for my carnivorous regiments I suspect that "real" dinosaur babies may have looked a lot more like smaller versions of their parents than something out of a Saturday morning cartoon show. In any event Dinosaur babies have a real place in a collection meant for either a child or the serious collector. In regards to "safety" the Safari products are all toxin-free and currently fully tested. They are veritably guaranteed to be safe to eat by your carnivore Dinosaur toys (and even you). Many of the 'Made in China' figures have no indication of their safety (i.e. the Euro-Union "CE") or toxicity, if any. 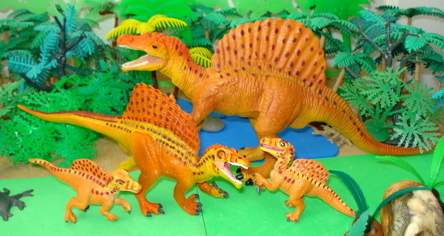 In closing I would simply note that there are many, many other Dinosaur toys (Ankylosaurs, Dimetrodons et al) that come in both larger and smaller sizes, creating the opportunity to make little families and large, mixed-age, herds (or packs). This page is just the barest taste of what you can do. 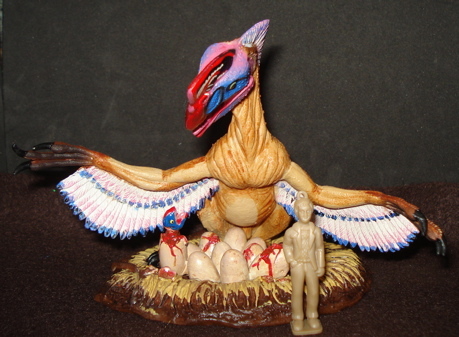 You have been reading the toy Dinosaur babies page of the Dinosaur Toys Collectors Guide. Click HERE to return to our main page.